In the aftermath of the ₹12,600-crore scam at state-run Punjab National Bank, access to overseas credit has become increasingly difficult, especially for small and medium enterprises (SMEs). 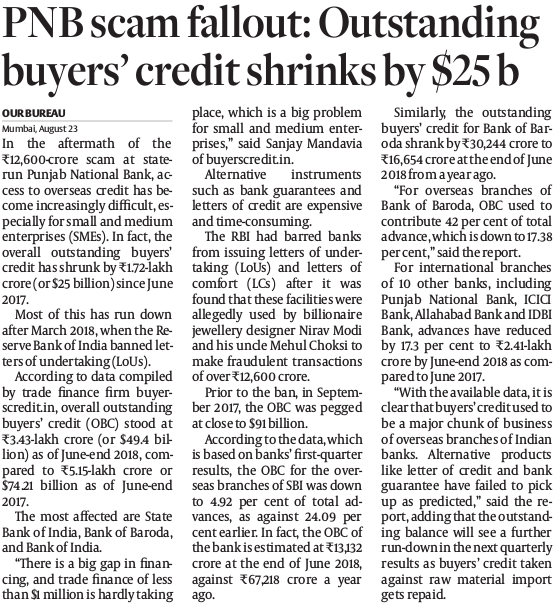 In fact, the overall outstanding buyers’ credit has shrunk by ₹1.72-lakh crore (or $25 billion) since June 2017. Most of this has run down after March 2018, when the Reserve Bank of India banned letters of undertaking (LoUs). According to data compiled by trade finance firm buyerscredit.in, overall outstanding buyers’ credit (OBC) stood at ₹3.43-lakh crore (or $49.4 billion) as of June-end 2018, compared to ₹5.15-lakh crore or $74.21 billion as of June-end 2017. The most affected are State Bank of India, Bank of Baroda, and Bank of India. “There is a big gap in financing, and trade finance of less than $1 million is hardly taking place, which is a big problem for small and medium enterprises,” said Sanjay Mandavia of buyerscredit.in. Alternative instruments such as bank guarantees and letters of credit are expensive and time-consuming. The RBI had barred banks from issuing letters of undertaking (LoUs) and letters of comfort (LCs) after it was found that these facilities were allegedly used by billionaire jewellery designer Nirav Modi and his uncle Mehul Choksi to make fraudulent transactions of over ₹12,600 crore. Prior to the ban, in September 2017, the OBC was pegged at close to $91 billion. According to the data, which is based on banks’ first-quarter results, the OBC for the overseas branches of SBI was down to 4.92 per cent of total advances, as against 24.09 per cent earlier. In fact, the OBC of the bank is estimated at ₹13,132 crore at the end of June 2018, against ₹67,218 crore a year ago. Similarly, the outstanding buyers’ credit for Bank of Baroda shrank by ₹30,244 crore to ₹16,654 crore at the end of June 2018 from a year ago. “For overseas branches of Bank of Baroda, OBC used to contribute 42 per cent of total advance, which is down to 17.38 per cent,” said the report. For international branches of 10 other banks, including Punjab National Bank, ICICI Bank, Allahabad Bank and IDBI Bank, advances have reduced by 17.3 per cent to ₹2.41-lakh crore by June-end 2018 as compared to June 2017. “With the available data, it is clear that buyers’ credit used to be a major chunk of business of overseas branches of Indian banks. Alternative products like letter of credit and bank guarantee have failed to pick up as predicted,” said the report, adding that the outstanding balance will see a further run-down in the next quarterly results as buyers’ credit taken against raw material import gets repaid.